Do you know your pH level? Not in your pool, but your personal pH level? I was intrigued when the box of test strips arrived. We have tested just about everything and everyone around the house this week! Why should you be concerned about your pH level? Simply put, pH is a measurement of your body’s electrical balance and helps to regulate several bodily functions. If your pH varies too much it’s difficult for enzymes to function properly, which can lead to illness. The fastest, most accurate way to measure your pH is by using pH test strips. 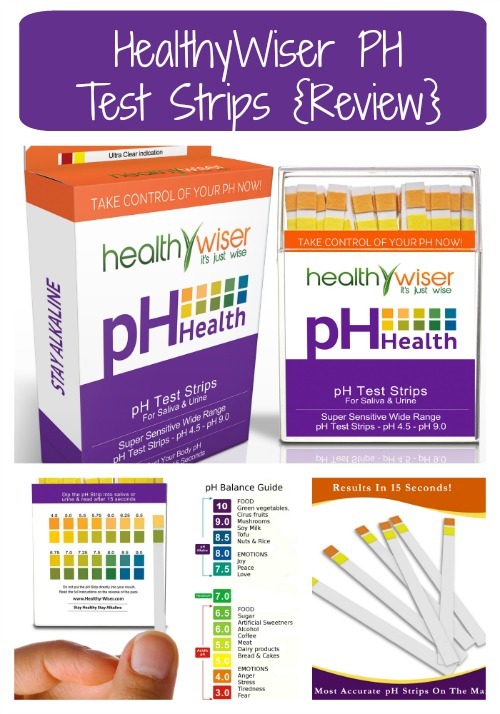 Healthy Wiser pH Test Strips make it easy for you to monitor your pH levels from home and get fast, accurate results. Using either saliva or urine you can test your pH to determine if your body is too acidic or too alkaline. To test using saliva you should wait 2 hours after eating or drinking. Do not rinse your mouth. Spit saliva into a spoon, dip the HealthyWiser pH Strip into the fluid until both pads on the test strip are sufficiently covered with liquid; wait 15 seconds before reading your pH. To test using urine you should use the first urine of the day. To test, briefly place the HealthyWiser pH strip in the urine – mid-stream, then shake off any excess fluid and wait 15 seconds before reading your pH. Remember to wait the full 15 seconds before reading the results. The color of the indicator pads may change further after that, but the most accurate reading is taken at 15 seconds. Compare the color of both pads against the indicator chart on the packaging. The plastic box contains 100-count pH test strips. These strips can also be used to test your drinking water, swimming pool, hot tub, hydroponics, aquariums, food, and coffee. The strips also have dual pads which ensures super accuracy with results in 15 seconds. This is a super easy way to monitor your pH levels and almost a requirement for those that need to monitor their levels because of diabetes, joint pain, arthritis and osteoporosis. Being able to monitor your levels and notify your physician when changes. Grab a set of HealthyWiser Ph Test Strips from Amazon for easy shopping. Shipping is free on prime accounts. We are giving away a box of these test strips too! Just enter below. Disclaimer: The information on Simply Sherryl is provided for informational purposes only. It is not intended to be substituted for the advice provided by your doctor or other health care professional. If you rely upon any programs or techniques, or use any of the products and services made available by or through the use of our website for decision making, without obtaining the advice of a physician or other health care professional, you do so at your own risk. The nutritional and other information on our website is not intended to be, and does not constitute health care or medical advice. The views expressed on Simply Sherryl have not been reviewed or endorsed by the FDA or any other private or public entity. Simply Sherryl is an independent, privately run business separate from any other organization.